Surfing eBay one afternoon, I stumbled upon something unexpected that sparked my interest. 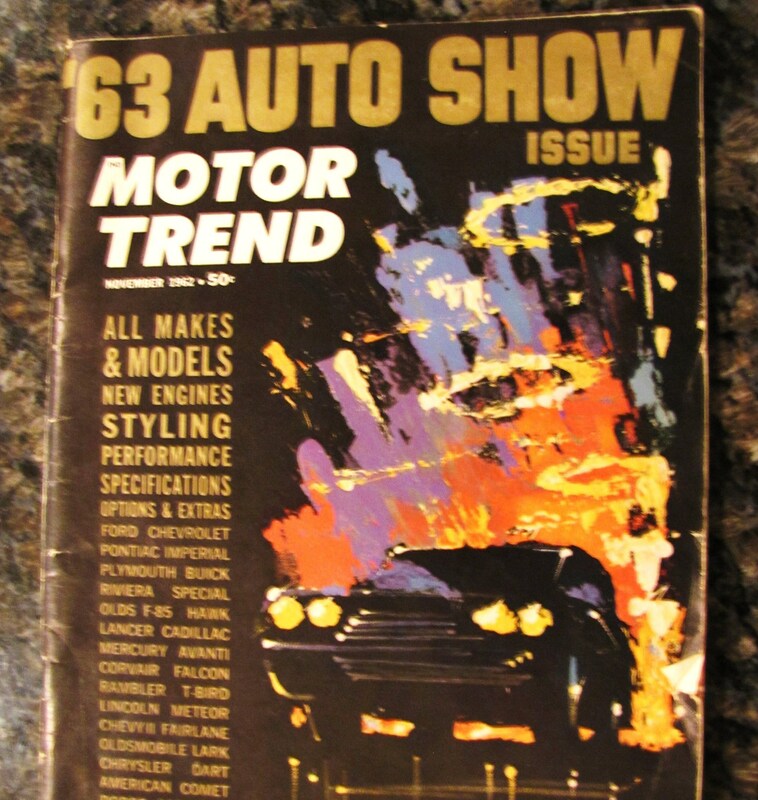 It was a 52-year-old magazine, but one that brought memories rolling in like a fleet of wide-track Pontiacs. 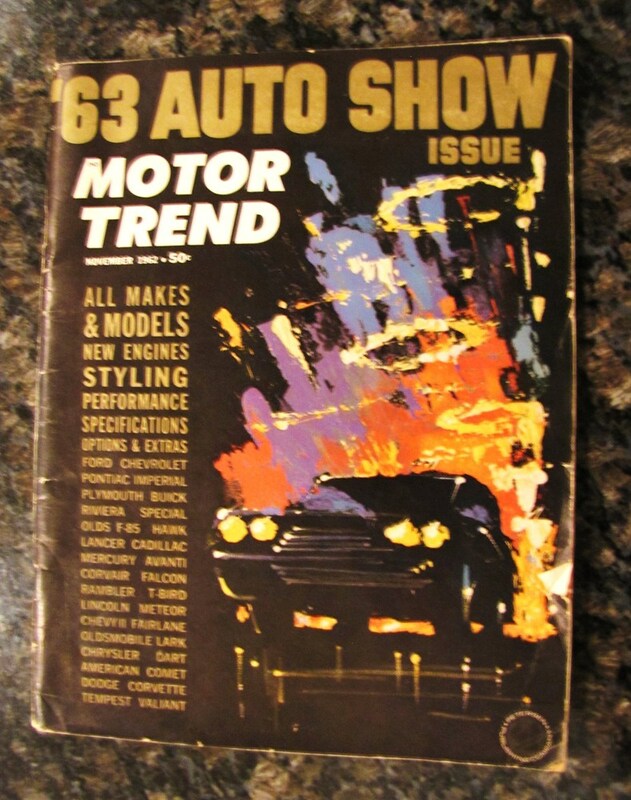 The magazine is an automotive classic, in my humble opinion, the 1963 Auto Show edition of Motor Trend from November 1962 that presented the latest model year of 1963 American cars. In those days, my pre-pubescent automotive obsession was just awakening, and these were the cars that I first recall noticing, memorizing every contour, taillight and sparkle of trim. The Swinging Sixties were just getting under way in 1963, and it was a memorable year for many reasons, some good, some terrible. For American automakers, it was a year of memorable vehicle launches, three of which were for cars that became iconic for their breakthrough styling. The true gearheads among us can easily recite this ’63 trio without hesitation: Chevrolet Corvette Sting Ray, Buick Riviera and Studebaker Avanti. Yes, there were other great domestic cars from this model year – such as a restyled lineup of Chrysler products – but those three are the ones that make 1963 a most-notable year. 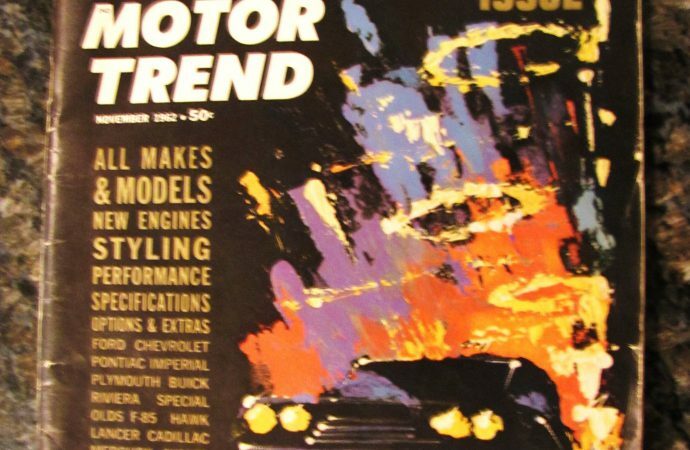 The Motor Trend magazine with its fiery, abstract cover illustration is an absolute window on this mid-century era, rekindled in the past few years by the Mad Men TV show. Mostly, though, the publication shows how much things have changed. Open the front cover and there’s already a relic from the past, an advertisement for L&M cigarettes with a heartwarming Norman Rockwell-style illustration of a proud papa, cigarette in hand, watching his toddler son get a haircut. The ad slogan: “When a cigarette means a lot…” No cancer warnings in 1963. On the back cover is another cigarette ad, for Chesterfield King and its “$181,000 Sweepstakes,” which includes a drawing of a groovy modern ranch house – a first-place prize – as well as other prizes such as new Ford Thunderbirds and Falcons, or an RCA Victor color TV. The 1963 Auto Show edition is all American, with no mention of any of the “foreign cars” from Europe that had gained in popularity: British and Italian sports cars, German luxury cars or even Volkswagens. You wouldn’t know it from here, but the 1963 model year also marked the launch of the extremely popular MGB sports car, which over the years sold in the hundreds of thousands in the U.S.
There’s good reason for the domestic bias, though, since the edition is dedicated to the Automobile Manufacturers Association, which would be putting on the 44th annual National Auto Show in Detroit’s Cobo Hall the following January. There was a section with short histories of the domestic brands as well as profiles of the leaders of the companies. Which is interesting reading but bittersweet since so many of those great auto brands have since departed, including Studebaker, Plymouth, Mercury, Pontiac, Oldsmobile and Rambler. The best parts of the magazine, though, are the multiple pages with crisp black-and-white manufacturers’ photos of the new crop of automobiles. This was a great era for styling, and the images of the cars provoke not only feelings of nostalgia but real longing to have them in the garage once again. Which ultimately is what fuels our old-car hobby. Avanti also gets the full-page photo treatment; the magazine notes “its body is fiberglass, its performance lively, and its price high.” The Raymond Loewy-designed Studebaker coupe would live on in several reincarnations well past the eventual demise of the automaker. Motor Trend is famous not only for its popular magazine but for the annual anointing of its Car of the Year. So which of these handsome and advanced automobiles took the prize for 1963? Surprisingly, the Car of the Year was Rambler and its redesigned Classic and Ambassador models, which are mere footnotes of automotive history. Kind of makes one wonder. Of course, the advertisements are a trip back in time. Besides the dramatic ads for the new cars, there are also those for auto products. 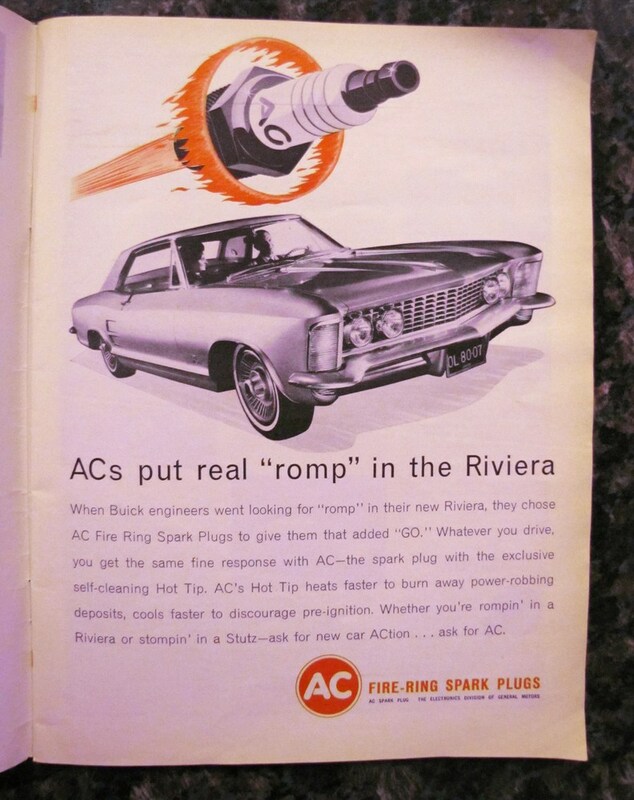 There’s one for Judson: “For REAL performance from your Corvair, you need a REAL supercharger.” A Pennzoil Motor Oil ad features “Mr. Eliminator” Don Garlits posing with his dragster named Swamp Rat III. For hot rodders, there are ads for Stewart-Warner tachometers, Dana limited-slip differentials, Mallory Double-Life Distributors and Hurst shifters. And there are the then-ubiquitous ads from J.C. Whitney & Co. Here we find such items as the Hollywood Noise Maker Muffler; the fluffy Winking Cat for your rear deck with red eyes that light up along with your turn signals and brakes; white sidewalls that fit over your boring black-wall tires – a bargain at $4.50; a Hollywood Wolf Whistle; Hula Hula Doll for your dash; the famous cigar-smoking Wild Woodpecker decal; and a record player for your car. There’s also an ad for a free J.C. Whitney catalog, 356 pages of unmitigated desire for adolescent motorists. So yeah, it was a very different time. But the style and substance of the American cars of the early ’60s live on among those of us who remember how totally cool they really were.